Tuesday, January 12, 2016, 1900 Hrs, 45 degrees - Fair sky. Sorry for not making a blog for Monday, I was too worn out after a lot of hard work and had to eat and go to bed early. On Saturday, I looked on the weather website and it was not showing any rain, however, at about 2:00 PM as I was cleaning our trailer exterior body to prepare to paint it, the light rain came and it didn’t stop until close to dark! How nuts! I didn’t do much on Sunday since it was my day off, mostly relaxing and watching the campfire most of the late afternoon. Yesterday (Monday), I managed to finish off the seal with roofing cement on the roof of our RV and after a long week of “wet weather and wet ground” I re-installed the Solar Panel and let the battery charge up for the day. I also managed even up the ground after mud was dried up which took me a while to do. I also removed all old wood out of the RV’s storage compartments. I piled it up far behind the RV. I don’t know what to do with it. I can’t burn it in the campfire pit because it’s laminated on one or two sides of the wood. Maybe if I can move it away from here on our land and burn it, but I don’t know yet. 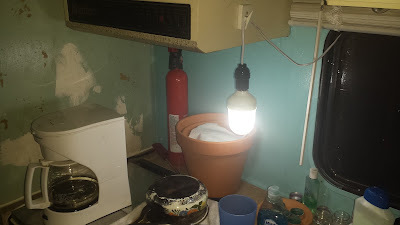 I also moved 4 of our Solar Lights that we got from 99 Cents Store to the roof area and tied them down with a twist tie. That way when Beth comes here to visit me like she did last time at night, she can see some lights. Also Beth told me that we got accepted to “Rent-The-Chicken”, now we need to ask for donation or raise fund to get the materials so I can built the “main coop” and smaller coops. You can call beth at 714 699-3323 and see what you can do to help us. This morning when I woke up, it was very cold and a “frost zone”! Geez, I had hard time getting out of my bed because it was so cold! After I managed to get out of bed, went outside and noticed everything is icey! On the ground, on windshield and windows on both of vehicles and RV windshield. Yikes! I refueled the generator so I can fired it up to charge my battery and brew some coffee. Which reminds me I am running low of coffee grounds. Any help would be appreciated, we need items that are listed on the Amazon Wishlist at: http://tinyurl.com/ocdac-wishlist PLEASE do help and support us today! We need lots of materials. After I got my phone battery charged up and finished with my coffee, I turned off the generator to save gas which I am getting low on gas, I would say about 4 days worth of gas left! Your cash donation for the fuel cost is appreciated by calling Beth at the number shown above or you can donate on our website. Anyway, after the weather started to warm up in 50 degrees I went up to check out the roofing cements and did some 2nd coats of patches around, now I only have ¼ a can left. I also managed to store our equipment in the RV’s storage compartment including a ladder, shovels, a chain, etc and it has all been locked up. I also finally had the door window replaced today. After first 3 screws were drilled in my hand drill tool battery went dead so I had to fire up the generator to charge the battery for an hour. 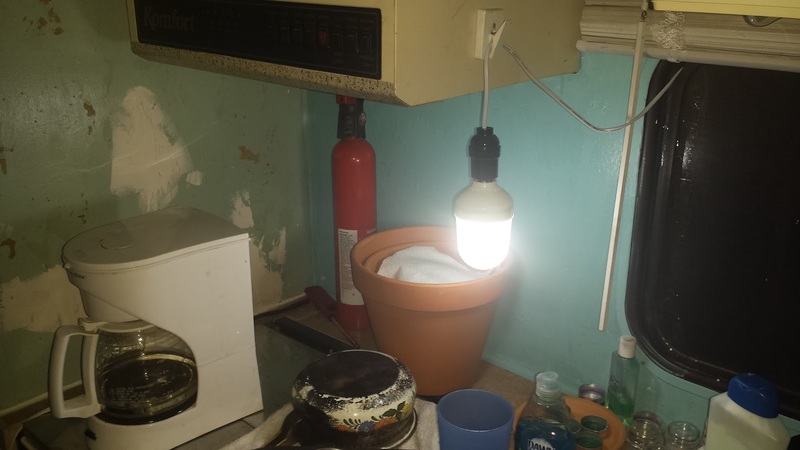 In the meantime, while I was waiting battery charge up, I tried to figure out how to get the solar powered light into my kitchen window to hook it up. So, it didn’t reach too well, so I had to slowly move the solar panels down about 3 feet and a foot over to be closer to the RV. Now I can get the line to reach into the kitchen! I also can’t figure out how to put the power convertor on the battery while another power control box is already clipped on the battery. After 1 hour of charging the drill battery, light is still red instead of green, so I turn off the generator and finally finish off the screws on the door window. I then seal the edge of the plastic window with silicone inside and outside and did finish off seal around the door frame. I need to do 2nd run to seal inside door window after the first seal dries up to prevent air draft blowing inside when it’s windy. It became dark so I gathered up all my equipment and locked them up for the night and fired up both vehicles to charge up the battery for 15 minutes while I prepared dinner with the solo-stove and it cooked pretty fast! After I ate, I shut down our vehicles for the night. Well, that’s about it, tomorrow I plan on to take a quick bath then finish off working on our trailer to paint it.